Lula da Silva and Dilma Rousseff in October 2014. Fabio Rodrigues Pozzebom/Agência Brasil. Some rights reserved. In Mai 68 n´a pas eu lieu, Deleuze and Guattari react to the statement that nothing survived the cycle of struggles of that magical year, 1968. Published in 1984, in the gloomy atmosphere of the Reagan and nuclear fear era, the article demanded "a little possibleness, lest we choke". For the authors, it was as if the constituent momentum of the new worlds of May 68 had completely disappeared from the narrative and understanding of the historical present. The disappearance had taken place on both the left and the right of the political-ideological spectrum, resulting in a broad front of oblivion. Unlike other revolutions, which reached their crystallization point in producing new institutions and collective assemblies – as happened with the New Deal, Japan’s takeoff, the European Welfare, despite all its ambiguities - that event was completely blinded. Everything that had been opened, as a field of possibilities, ended up being repressed, caricatured, and marginalized. Whereas, on the one hand, the narratives about the crisis experienced at the beginning of the 80s erased from their memory May 68 - an event that had hardly happened -, on the other hand, according to the authors, its tracks were resurfacing as night memories, from which forces could be recreated to overcome current impasses and unblock current problems. The paradox of this formulation is that even though it did not take place, according to historical linearity, May 68 created nevertheless the conditions for an event to break this linearity, thus freeing it from its blocks. Brazil is currently in trance. Multiple time scales are bending and unfolding at a time when the past, the present and the future appear in sync. Old ghosts are coming back, and new specters haunt the scene. The country is going through the worst economic crisis since the early 1980s, with rising unemployment and a productive contraction affecting several sectors, as shown by the indexes, resulting in increased social inequalities - which is something that did not happen two decades ago. In addition, the Zika epidemic, poorly counteracted by the authorities, has spread to all 26 states, and optimistic projections are already foreseeing that tens of thousands of children will suffer from microcephaly in the near future. There is also a political dimension to the crisis, with the collapse of the governance conditions which granted some energy and ensured a degree of consensus to the coalition led by the Workers Party (PT), in government since 2003. This is also a crisis of subjectivity: there is disenchantment with politicians and politics, pessimism regarding the capacity for socio-economic recovery, recurrent appeals to fear and moral panic in order to gather support through the path of negative utopia: "choose a side, or else...". However, any attempt to reduce the situation to ready-to-wear narratives of the "all or nothing" sort runs the risk of triggering tremendous simplifications, or falling into simple adherence to power blocks the configuration of which, after all, strengthens the causes rather than the resolution of the problems. The false problem this time is the impeachment that is to be voted by the Chamber of Deputies on the second half of April. 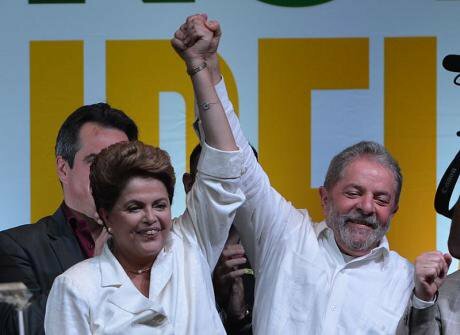 Whatever the outcome - Dilma’s exit, or not -, it will be a conservative outcome. To begin with, because the impeachment is an inside job: as in the Netflix series House of Cards, its main originator is the current Vice-President, Michel Temer. Second, because the presidents of the two legislative chambers who will judge Dilma, Eduardo Cunha (House) and Renan Calheiros (Senate), are up to their necks with the same Petrobras-centered corruption scandal which prompted the political scenario that led to the impeachment proceedings in the first place. Temer, Cunha and Calheiros make up the triumvirate of the Brazilian Democratic Movement Party (PMDB), the party with the largest number of congressmen. In late March, the PMDB left the coalition it had been a part of in the last ten years, much to Dilma’s dismay, who said "she wished it had stayed." However, let us not be fooled by appearances: the PMDB carried out an "exit inwards", for betting to gather the two-thirds majority in Congress to remove the president from office and hand power to the vice-president is not an easy task. Without the PMDB, Dilma’s last option was to turn her cabinet into a Disney-Land of ministries, posts and funds to win over the "undecided" votes - as if congressmen from small and medium parties were to be welcomed by Mickey at the entrance: what attraction do you want to ride? It is not known whether the mercenaries will prefer to sell their support for cash (Dilma) or installments (Temer). The Progressive Party (PP), the fourth party in Congress, has become the key element in the arithmetic of despair. The PP is heir to the old Arena, the official party of the military dictatorship, whose alliance the PT government is now trying to get at any price, while promising its bases a turn to the left. What if the impeachment fails? In this case, the way is set for the return of Lula. Virtual PT candidate for the forthcoming 2018 election, Lula had to anticipate the campaign when Judge Sergio Moro, who is investigating the Lava-Jato operation, began to question his business dealings with large construction companies involved in the looting of Petrobras. In order to both strengthen the government and provide Lula special protection before the law, Dilma appointed him cabinet minister - or, rather, "super minister", with sweeping powers, in charge of saving the harvest. A number of legal skirmishes, combined with Moro’s unlawful disclosure of some private recordings, managed to prevent the former president from taking office immediately, although the obstacles are likely to be lifted by next week, so that Lula will finally take office. Undoubtedly, Lula, far from being dead, could still surprise everyone with his ability to activate popular mobilization, although he is today quite a different figure from the one that left the Planalto Palace in December 2010. But let us not be romantic: Lula, like the eventual president Temer, does not intend to carry out any significant shift in the government’s course. There is no radicalization on sight, just a struggle for survival. The program of both Temer and Lula is to rebuild governance, currently in tatters, to feign some partial response to street mobilizations, and to muster enough energy to carry out a minimally positive plan for economic recovery. Basically, this is to prevent the sky from falling down on the entire political system before 2018. More relevant than the issue of impeachment is the course social mobilization will take from now on. Since last year, millions are taking to the streets to protest against corruption and against the political system in general, with the PT topping the list. Another group, smaller but quite expressive and organically cohesive, is also occupying the streets to defend the government from what they think - reproducing the imaginary of the 2002 coup against Chávez in Venezuela - is nothing but an imperialist coup, aimed at destabilizing a popular government. This discourse remains firm and strong among the pro-government militants, although there is actually no evidence that a coup is being staged. The Brazilian armed forces have been removed from the political game for decades now, and the Supreme Court, where 8 out of 11 members were suggested by the PT, has approved and closely monitored the parliamentary procedures for the impeachment. The millions of demonstrators in the streets become several million more in the social networks, where debates, claims, jokes and pitched narrative battles are multiplying. Between the extremes from both sides - who long for authoritarian or messianic shortcuts and reduce the other side to totalitarian - a vibrant democratic process is going on in Brazilian society, the ultimate meaning of which is none other than the fight for a new concept of politics and democracy. This is, in fact, a global trend, stemming from the cycle opened up by the Arab revolutions, the 15-M movement, the Occupy and the Gezi Park protests in Turkey, among other large mobilizations. In a recent article in openDemocracy, Bernardo Gutiérrez described some of the processes emerging at the crossroads of global and local transformations, of Latin America and the world at large, which bypass the national-popular and the left-socialist political culture. The disavowal of existing politics goes hand in hand with the wish for a mobilised democracy and its specific potentialities, which the logic of networking and intensive social productivity make possible. Its expressions have been damped by ideological impasses, by fear mongering and induced moral panic, by efforts to demobilize any alternative other than adhering to "more of the same". The resulting polarization "from above" is a structural block: it systematically obstructs the energies which can regenerate the institutions "from below", or come up with new ones This causes a noisy and increasingly unbearable tension, which can lead to repressed anger and eventually knock out the pins of the political system. It is in this sense that the June 2013 uprising did not happen - although it affected, one way or another, Brazilian society as a whole, on the basis of real antagonisms: public transportation fares, housing, right to the city, the “gay cure” project, exorbitant expenses and right violations related to the Soccer World Cup organization, the police emergency state, and the "where is Amarildo?" campaign which attracted national and international attention and put up front once again the issue of racism. Thanks to the campaign, the truth about the Amarildo case surfaced: in July 2013, a black worker was tortured and killed by police agents from the "pacifying unit" deployed in the Rocinha favela in Rio de Janeiro. The resolution of this case meant the bankruptcy of the concealing paradigm for state crimes occurring on a daily basis in Brazilian cities. As Alexandra Mendes and Clarissa Naback wrote recently, the events in 2013 displayed two main trends: they were claiming rights and demanding answers from the government; but they were also immediately productive in terms of the occupation of legislative institutions, the setting up of new networks and groups, and a long chain of "media activisms" that defied the conservative media. The impact of the 2013 protests at the time was such that, among other achievements, Dilma went on national TV to propose the convening of a constituent assembly, public transportation fare increases were canceled, the removal of favelas stopped, and the bill instituting the "gay cure" was shelved. For the authors of the article, in order to escape the impeachment trap, the most consistent political position today is to demand new elections. That is also the position of Marina Silva and Luciano Genro, who represent the third (21.5%) and fourth (1.5%) political forces at the last elections (October 2014). New elections, even if they would not solve all of the problems, would at least work as circuit breakers, much as when the Stock Exchange faces an accelerating crisis. However, June 2013 was erased from memory and its existence denied by both left and right narratives. This denial came along with repression, which intensified in the period from October 2013 to the Soccer World Cup in July 2014. June pushed the political system up into the air, where it flipped several times and then fell on its feet like a cat... and started clawing. On the left, the struggles of 2013 were disqualified because they were considered a nihilist and fascist uprising, a drifting, disorganized breeding ground prone to reactionary impulses, according to the old Hobbesian-Burkean argument that crowds are chaotic and fickle. From the traditional right, the June protests were contaminated by vandals and criminals who distorted the demands of decent citizens. In both cases, the most heated condemnation converged on the cursed figure of the black blocs, a wholly unassumable actor. In 2013, amid preparations for the 2014 Soccer World Cup, the streets were shouting "There will be no World Cup", and they were shouting louder each time the riot police repressed them. The cry swept rebel Brazil. Along with the repression that took place in the following months, the government and its media decided to respond to the demonstrators the following year by launching the campaign "Yes, we will have a Cup". They did it while coordinating an unprecedented military-police apparatus to thwart any protest, fully equipped and entitled to kettling, preemptive strikes, massive spying on activists, preventive detention, and assorted threats and intimidation. In 2016, the answer escalated when the slogan "There will be no World Cup" was replaced by "There will be no coup", chanted to the same tune. All the legal and illegal tricks which have been used by Batman-style Judge Sergio Moro against the government’s allies, which are now complaining about the police state, were already there, and they were carried out more brutally, during protests in 2013-2014, when the pro-government forces were in power. They never ceased to be there, in fact, considering the regularized state of emergency for the management of poverty in the favelas and suburbs where mainly black and indigenous communities live. The same intellectuals linked to the PT who are today calling the millions of protesters in the streets and the networks elitists and downright fascists used the same formula to not only discredit the 2013 uprising, but also to join in the repressive consensus that, once the dust of the marches cleared, fell on hundreds of new groups and thousands of activists. These intellectuals, like the conservative media journalists, won twice: first, they won along with the repression of the protests, which they legitimated; second, when we observed, during the biennium 2015-2016, that the autonomous collectives and black blocs all but disappeared from the streets, which were then occupied by civic demonstrations against corruption and pro-government protests, duly domesticated by the party in power. Amid all this, however, their voices continue to resonate here and there, either when opposition politicians are jeered in a tone reminiscent of the 2001 Argentinian "Out with them all", or when minority groups resist being instrumented in the name of fear and reject the logic of passivity. Today, the June 2013 protests are a no-event, an anomaly in the linearity built by those who are telling the story from the watchtowers of power. To the left of the government, it is said that the void left by the end of the PT cycle will be filled by a new right which will restore the Washington Consensus neoliberal night. Since they believe that they are the only historical subject that can bring about change, it is only normal that they should use the après nous, le déluge grammar. It remains to be explained, though, why it cannot be considered that this turn to the right already happened under Dilma’s government, with the austerity reforms, the corrupt mega-business schemes, and the repressive legislation that has nothing to envy the 90s. To the right, a vigilante front is being organized from outside the political party system, which intends to assault it like a Hegelian "broom of God": a conservative sanitary move for the sake of efficiency, obedience and competitiveness. What remains to be explained, in this case, is how democracy can be deepened through undemocratic institutions such as the police, the judiciary or Sao Paulo’s current top business class. It we resign ourselves to these predetermined decisions, there will be no thinking or effective action, but only adhesion and reproduction of the same schemes. So, in a scenario where we are constrained not to choose, we must choose to choose. June 2013 was an event that cannot be reduced to the terms of what is currently being disputed. The question arises: where are the creative conditions that the protests opened up three years ago? Where are its vestiges, its resonance, and the cross-dichotomy networks? How to avoid the pitfalls of a superficial and helpless polarization? There is no predetermined way out, particularly if it comes from an ideological recipe. In their book about May 68, Deleuze and Guatari said: Il n'y a de solution que créatrice (there is no solution, if it is not a creative one).